My family wanted to visit a new (to us) area of Yellowstone this year. We made the trek to the Cave Falls area, in the south west corner of the park. 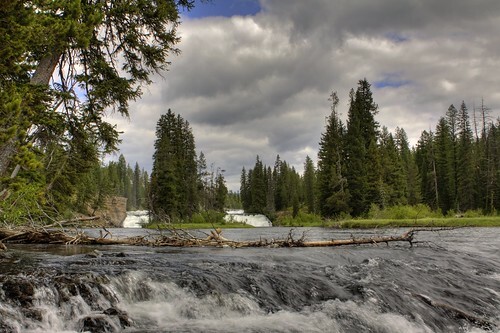 This is the corner actually in Idaho, and is known as the Cascade Corner because it features many falls and cascades. We did some hiking and photography. Of course, I brought my rod and bribed the family with a lunch at Frostop’s in exchange for a few minutes on the water. Unfortunately, I did not bring waders, and wading wet for the 15 minutes was enough for this very cold water. So, that worked out anyway. 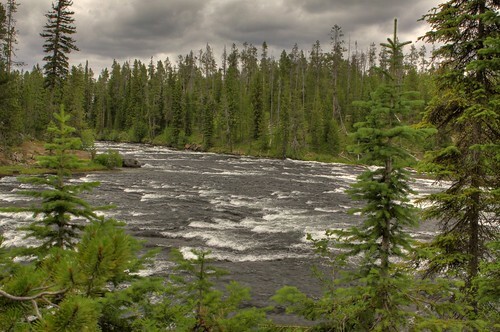 Driving up to the Cave Falls area, my excitement was building as we drove by miles of rifflely water, with no other humans around. This was the amazing part, we had a whole area of Yellowstone all to our selves, in the middle of July. Who would have thunk it? We did run into a pair of hikers, who must have parked at the Bechler ranger station, or were impressive hikers. Also, a pair of fishermen were arriving as we left. Other than that, it was just us and the mosquitos. Some have their 15 minutes of fame. I had 15 minutes of fishing. It was short, but sweet. Brought 3 rainbows to hand in that time. They were small, but fiesty, in the 10 to 12 inch range. Did I mention the river was cold? With wet wading, 15 minutes later my feet were numb, so this worked out. Also, the short time kept me from a knee injury slipping on the glass smooth polished rocks that line the bottom of the Falls river. Next time, felt soles & wading staff.